I'm new to inkscape and I didn't find a way to link two rectangle objects with a line (for example linking bottom right corner of the first rectangle with top left corner of the other rectangle) in such a way that when I move one rectangle or the other, the line automatically adapts. This post (How to Connect Bezier Curves in Inkscape?) does explain how to join selected nodes but it produces a "grouped object" and is not what I am looking for. This seem like a basic feature and I'm afraid my post is probably going to be flagged as a duplicate (which I didn't find). There is no way to connect a node on a closed path, such as a rectangle, to a node on another path directly, so as to keep them attached. 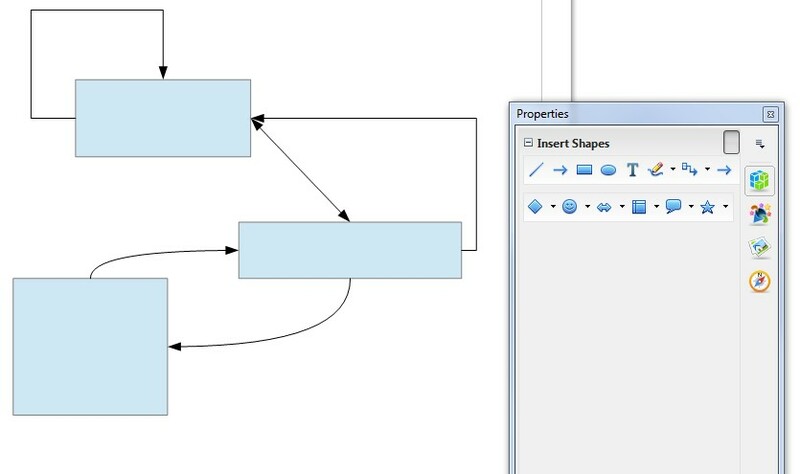 However it is possible to use the Create Diagram Connectors tool to do something like you describe. Assuming you have already drawn two rectangles, select the tool and mouse over one of them. You should see a tiny square appear in the middle of the shape, click and drag from that square to the square in the middle of the other rectangle, and the two will be connected with a line. The effect is live, and the connector line will move as you move the rectangles, to keep them connected. It is also possible to set up the options on the tool to create connectors which avoid shapes, and with curved corners. Obviously, the functionality is intended to create diagrams. OOD is freeware. It can be too limited for artistical purposes, but many types of technical and business diagrams come out easily. The image can be copied and pasted to Inkscape, but the connectors unfortunately lose their elasticity, they turn to normal shapes.